What Can a Glendale Heights Auto Body Repair Shop Do for Your Vehicle? One of the unfortunate aspects of owning a motor vehicle is watching it suffer exterior body damage. With each scratch of its paint, each ding of its doors, and each dent of its bumper, your vehicle loses just a little more of its value, and you likely become a little more disappointed. Fortunately, however, you don’t have to let these damages persist. Auto body repair shops exist for these very purposes. Wondering what a Glendale Heights auto body repair shop can do for your vehicle? Read on to find out! Unfortunately, dented bumpers are very commonplace. Not only can you dent your bumper by backing into a pole or a mailbox, but by running into the back of another vehicle in slow traffic. The truth of the matter is that there are countless ways in which you can damage your vehicle’s bumper. Fortunately, bumpers can be easily repaired or replaced by an auto body repair service. These types of repairs are performed very often, and they’re usually very straightforward. The costs associated with these repairs and replacements often varies, but they generally costs around $250 to $500. Although we might not realize it, automobiles can be pretty fragile. It doesn’t take much for a car to take on damage. Even a slight bit of physical trauma can leave obvious and unsightly dings on your vehicle. For example, if someone who is parked very close to you opens their door too fast, a ding can appear. If hail falls from the sky, multiple dings can appear. A stone kicks up and hits your vehicle while driving? You guessed it; a ding can appear. The good thing is that minor dings are generally not difficult to repair. Most auto body repair shops fix them on a regular basis, usually doing so for between $50 and $200. Just as dings can easily form on a vehicle, paint can easily become scratched on a vehicle as well. Again, it doesn’t take much for this to happen. A wayward stone, some misdirected car keys, a wild ice scraper, and a variety of other entities can cause a vehicle’s paint job to scrape. While this is certainly a problem, it’s not an unfixable problem. 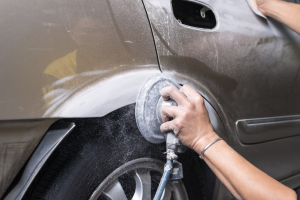 Vehicles can be repainted, and minor scratches can be quickly repaired. Generally, auto body shops will repair small scratches for around $250. Entirely new paint jobs, on the other hand, can cost thousands of dollars. Auto body repair shops don’t only fix exterior cosmetic damage. They’re also more than capable of fixing suspension problems. If you’ve hit a few too many potholes, and your suspension has become misaligned, an auto body repair shop will be able to help you. The costs associated with suspension repair usually varies. If only a minor repair is needed, you will generally only have to pay a few hundred dollars. If, on the other hand, a full suspension replacement is needed, you will likely need to pay thousands of dollars. Looking for a Glendale Heights Auto Body Repair Shop? Are you dealing with a dented bumper? Did some unruly driver put a ding in your door? Looking for a Glendale Heights auto body repair shop? If so, Lombard Body and Fender is the shop you seek. As one of the premier providers of auto body repair in the Glendale Heights area, we have fixed thousands upon thousands of automobiles. Regardless of the auto body problem you’ve encountered, we can accommodate you.